Let’s say you bet on one number. A win pays 35 to 1, but the odds of winning are 1 in 37 because there are 37 numbers. So even when you win, you still lose because you are paid an unfair amount. This is unfair payout is called the “house edge” and it applies to all bets to slowly drain your bankroll. The only way to beat this “house edge” is to predict winning numbers with better than 1 in 35 accuracy. In other words, you must increase the accuracy of predictions. The problem with most systems is that they don’t increase the accuracy of predictions. 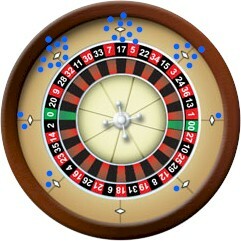 Roulette is all about where the ball lands, but most roulette systems don’t even consider the winning number. Instead, they use ineffective approaches such as increasing bet size to cover losses. This is called betting progression, and it may seem like a good idea at first. But the reality is all betting progression does is change the amount that you risk on an individual spin. Example: Say you bet $10 on red, and black won. Then on the next spin, you increased your bet to $20 to cover the loss. What you actually do is make two completely separate bets – one of $10, and one of $20. There is no connection. There are countless other equally ineffective approaches. Perhaps a player may think that after 10 reds in a row, black is more likely to spin because of a long-term balance. But if you checked thousands of instances when there were 10 reds in a row, and calculated how often black spun next, you’ll find the odds don’t change it all. The only way to beat roulette is by increasing the accuracy of predictions, which can only be done with physics because it’s the only set of rules that determine wheel and ball behaviour. Nothing is random. Everything is cause and effect. What we perceive to be random and unpredictable events are actually the result of cause and effect. Nothing is ever random. Predicting an event involves finding the relationship between variables and the event. My roulette system uses data sets from previous spins, and correlates them to other data sets, which uncovers predictable patterns that can predict future spins. Every wheel is predictable to some degree. It is very much like cracking a safe where countless combinations are tested to find the right one. The process uses permutations, which are calculations that test different “combinations”. The typical analysis of 300 spins involves literally billions of calculations so it is impossible to do without the help of computers. My software makes the analysis easy and practical. 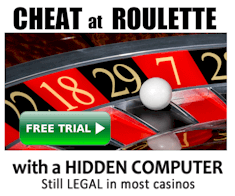 Doesn’t “randomized” wheel and ball speeds make roulette unpredictable? Any wheel still exhibits predictable patterns if the speeds are “randomized”. This is because a wheel has fixed physical properties that cause unavoidable long term patterns. Most wheels have “dominant diamonds”, where the ball tends to hit specific diamonds more than others. One example is you may notice that the ball may tend to hit particular diamonds much more than others. If you draw a little diagram showing which diamonds the ball hits on each spin, it may look like the one shown left. This is not random, and is one of the factors that cause predictable spins. If rotor speeds were properly and entirely randomized, matters would be quite different. But the fact is they are never properly randomized. Literally we’ve never seen a completely unpredictable wheel, and it may never exist. Even automated wheels that deliberately vary ball and rotor speeds do not do the job properly. So why don’t roulette wheel designers fix the problem? Firstly, they don’t properly understand it. Secondly, it’s not so easy because while roulette wheels are physical objects and have fixed physical properties, there will always be at least some predictability of spins. And this slight accuracy is all you need to overcome the slight house edge and win consistently. 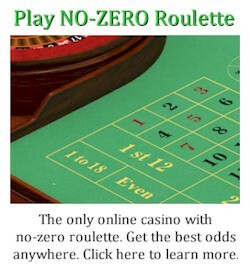 Ultimately while you may think roulette is totally random, it’s actually more difficult to make a wheel with completely unpredictable spins than to devise a method that achieves “better than random” accuracy of predictions. The free course provides more detail on how it is possible to predict spins even before the wheel is spun. It may be impossible to know the winning number on every spin. But the house edge is only slight, and you only need to be slightly accurate to overcome it and win in the long term. This is not at all difficult. My primary field is energy research. This includes everything from water-powered cars and efficient energy production systems. 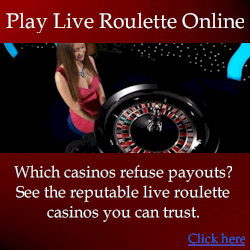 However I still actively developed various gambling systems, mainly focusing on roulette. While the first 10 or so years of roulette research resulted in nothing but frustration, I came to understand effective methods of modelling the relationship between different energy interactions. As you may know from Einstein’s E=MC^2 equation, everything is energy. A simple way of explaining what I found was “everything affects everything”. While this may be obvious, I found a way to analyze data about previous events to determine how they correlate to other events. In turn, this made it possible to predict future spins with some degree of accuracy. The main problem was that it required a lot of calculations and needed computer software. Over the years many versions were created, and the latest one is available to my players. Earlier versions were too complicated for some people to use, so not everyone succeeded. So it was gradually refined into what it is today: sophisticated software that’s remarkably easy to use. If you want to know more about my modelling of energy interactions, I suggest the book “Living Energies” by Callum Coats. It begins simple enough but becomes quite complex so you may need to read it a few times to properly understand the concepts.